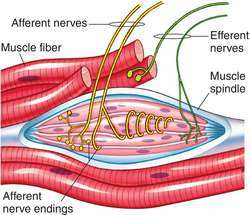 Discharge of the muscle spindles is not stimulated by the somatic fibers only. Muscle spindle recordings were analyzed from neurons with receptive fields located in the multifidus muscle (n = 3) and longissimus muscle (n = 17). The synapse between the muscle spindle Ia axon and the Ia interneuron is excitatory. For instance, the muscle spindles of those muscles to be lengthened should not be stimulated. Nonetheless, in the present investigation, acute exposure of WBV device that produced vertical oscillation with a higher frequency (ie > 30 Hz) and low amplitude (< 1 mm) did not induce potentiating effects to the stretch reflex possibly mediated by enhancement of muscle spindle sensitivity. Evidence from acute direct vibration studies suggest that an excitatory response of the muscle spindle occurs, which activates the Ia afferents. 2,4) The facet joint capsule and surrounding musculature have numerous proprioceptors in the form of muscle spindles and type I and type II afferents. The receptor portion of the muscle spindle is located midway between its ends where the intrafusal muscle fibres have no contractile element. Discharges in human muscle spindle afferents during a key pressing task. 1978) Muscle spindle responses in man to changes in load during accurate position maintenance. Evidence for presynaptic inhibition of muscle spindle Ia afferents in man. A potential mechanism to explain our findings may relate to the increase in muscle spindle activation induced by the tonic vibration reflex (TVR) mediated by the neural signal of the Ia afferents  and activation of muscle fibers via large alpha-motorneurons.